L-R: Liz Brough (Head of Community Relations at SDL), Kav Hood (young adult supported by The Donna Louise), Paul Gratton (CEO at SDL Group), Nathan Walton (Interim Director of Income Generation at The Donna NickyLouise Hospice), Nicky Birks (Partnership Development Manager at The Donna Louise). Nottinghamshire-based property services company, SDL Group, has recently revealed it has smashed its £150,0000 charity target by raising £182,500 with its partners for its chosen charity, The Donna Louise Hospice. With only one year to reach the ambitious target, fundraising started back in January at the company’s annual conference. During the conference, attendees were informed of the services The Donna Louise Hospice provides its children and young adults with life-limiting conditions, as well as their families. It was also revealed at the event that any money raised for the chosen charity would be matched by the SDL Group. 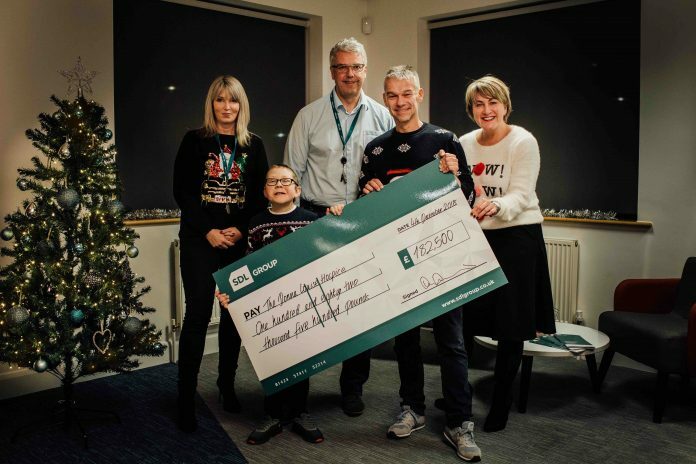 Since then, both employees and business partners have rallied behind the Group’s fundraising efforts through a combination of firm-favourite fundraising activities and the unique, including: pub quizzes, charity bingo, a clothes swap, bake sales and even employees getting ‘LOST’ in the name of charity. One of the most successful ways the company managed to raise funds was through charity auctions. Benefitting from the skills of SDL Auctions’ auctioneer, Andrew Parker, over £36,000 was raised from both the SDL Group black-tie event during the annual conference and SDL Auctions’ Red and Black Ball. The Group also used its extraordinary fundraising target as an opportunity to get its employees active by encouraging them to take part in a variety of activities from a company-wide football tournament to a weekly running club. Physical activities did not stop there, as some employees went above and beyond by pushing themselves to the absolute max, taking part in more extreme challenges. These included a mammoth 560km Tower to Tower challenge, climbing Snowden at night, The Three Peaks Challenge, a 50 mile fell run and a Coast to Coast Challenge. Commenting on the astonishing fundraising achievement, Paul Gratton, chief executive officer at the SDL Group, said: “Looking back to the start of the year when we set this formidable target of raising £150,000 for The Donna Louise, we weren’t even sure if we would reach the target, but we were determined to give it a go! Fundraising was not limited to The Donna Louise Hospice as an extra £40,000 was raised for other worthwhile causes, bringing the overall charity total to a phenomenal £222,500.